Southwest High School’s Communication Arts I class, taught by Mr. Steve Voyak, is already utilizing their Chromebooks regularly to supplement their lessons. Pictured above, from left to right: Kaylea Young, Heidi Sutter, Dezaray Cannady and Emily Snyder. To keep up with the demands of modern technology and learning, Southwest Schools implemented one-to-one technology for students at the middle school and high school levels this year. The move, according to Superintendent Bob Walker, is to improve instruction. The one-to-one technology initiative refers to each individual student having access to a tablet or notebook during school. 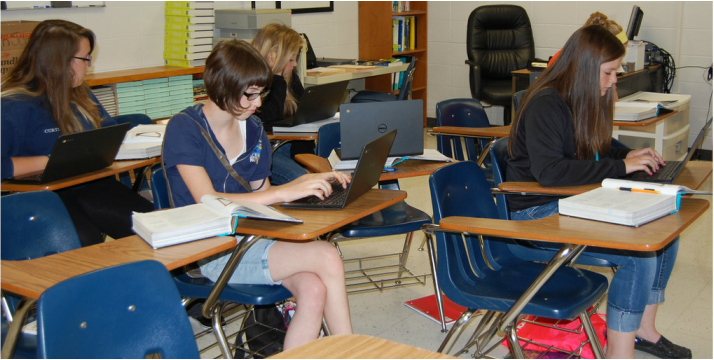 Walker stated, “Technology has become so much more a part of our students’ lives, it is only logical to assume when it is used correctly, it can enhance learning.” High school students each have Chromebooks to use during their school day, and middle schoolers use Promethean Kuno tablets. A final decision is yet to be made on what will be provided for the K-4 students, according to Walker. Elementary students still have access to the computer lab and workstations set up in the individual classrooms, as well until the switch is made. The total project cost the district approximately $255,000 for the notebooks and tablets. The Chromebooks were $320 each, and the Kuno tablets were $500. Those prices also included the storage and charging carts. Currently, the policy for use is for high school classrooms to be equipped with the Chromebooks and students use them in each room. For the middle school students, they are each assigned a Kuno at the beginning of the day, then return it during final hour. As it stands, students are not allowed to take the technology home to use. Walker said that the campus-only policy may change in the the future. While the program is still new and teachers and students alike are getting accustomed to the newness of the program, Walker said that there is a lot of potential with one-to-one technology. “Obviously, we have just begun this process, but we are very excited about how things are progressing. Some noticeable practices that are already being established after only a few weeks include high school and middle school students becoming more proficient in communicating with their teachers through their devices, assignments, quizzes, and details pertaining to upcoming activities are being exchanged in a paperless format,” he said. Walker went on to mention the benefits of education videos, researching being completed more quickly by students and the helpfulness of different applications for enhancing teachers’ lesson plans. The Chromebooks and Kuno tablets we’re purchased through a $300,000 funding lease purchase that also included 11 smartboards and other miscellaneous items. The purchase is a series of biannual payments made over three years.